This works better if you use GMail. You may also use Yahoo, although it may take a while before the Confirmation email reaches you. UPDATE: Webserver will be upgraded to accommodate more online reviewees. Enrollment is on-going. Thanks a lot for your effort to have this online real estate seminar review, which gives me enough confidence and courage to pass the… brokers board exam. More power to your program. The real estate online review covers topics taught in previous real estate brokers’ exams (prior to the passage of the RESA Law). These tutorials are in multimedia format, and RESAR Online Review members get 6 months’ access (180 days) to the online members’ area. Details will be announced via email in the Online Review Details List. Please subscribe using the sign-up form above. Current Status: The online review materials are now online, and are being accessed by the current batch of online reviewees. If you’re interested in joining the RESAR online review classes (self-study) please subscribe to the Announcement List to get the Online Review Payment Details via email. Thanks! The real estate online review (for brokers) is now available. Your username and password will be created and emailed to you within 36 hours from the time your payment (remitted via LBC Express Door-to-Door Delivery with your 12-digit Tracking Number starting with 11 [two one’s]) is received and verified. IMPORTANT: Please emphasize with the counter people at LBC Express that you want to remit via Door-to-Door Delivery. In other words, your recipient will NOT go to LBC to pick-up your remittance. Instead, the remittance should be delivered straight to the home of your recipient. Your 12-digit LBC Tracking Number should start with 11 (two one’s). Your username will be your email address, while your password will be the LBC Tracking Number of the payment that you remitted. The lessons will be distributed online every other day, to protect you from information overload. Please remit via LBC Express Door-to-Door Delivery, meaning the remittance should be delivered by LBC Express to your recipient. IMPORTANT: Your 12-digit LBC Tracking Number should start with 11 (two one’s), which is the starting code for Door-to-Door Delivery. If your Tracking Number starts with 101 (pick-up mode), please have LBC Express change it to Door-to-Door Delivery Mode. Why didn’t I receive the Confirmation Email? If you’re using Yahoo, please check the Bulk Folder. Why do we need to use the Online Review List? Some people make typos when entering their email addresses in the comment areas. The list, along with the confirmation email system, will help ensure the accuracy of your email addresses. Do we still need to attend a regular, face-to-face live review? Yes, you still need to, in order to get a Certificate of Completion of the Comprehensive Real Estate Seminar and Review (CRESAR). Only PRC-accredited review service providers will be allowed to give you a Certificate of Completion or Certificate of Attendance, which you will use when you apply for an Examination Permit. The RESAR Online Review is not accredited, and will not issue any Certificates of Completion. Its main goal is to help you learn faster and retain the info longer, through the power of the internet and its multimedia approach to distance training or e-learning. The regular, live, face-to-face review seminars usually run for 24 hours. These are offered in the form of six 4-hour sessions, or four 6-hour sessions, or two 12-hour marathon sessions. The RESAR Online Review, on the other hand, gives you 16 lessons spread out over 32 days. You can return to the lessons and review them as many times as you wish during the period that you have access to the online review. Where do we log in to access the online review materials? Where is my Online Review access password? Within 48 hours from the time you send the SMS text of your Name, Email Address, and 12-digit LBC Tracking Number, your user account will be created and the details will be emailed to you. Perhaps that email is in the bulk folder of your Yahoo! account. For more details, please sign-up for the Online Review Announcement List. Thanks! How do I enroll the the On-line review? and how much will I pay? [From the RESAR Admin] Please enter your Name and Email in the Announcement List to get info/updates. Thanks! just wanna know how much is cost of online review?Give me also the sked for the review and for the upcoming exams..
[From the Admin] Hello! For the latest info, please sign up for the RESAR Announcements List. Thanks! i am interested to take the face-to-face review classes for the real estate brokers exam. when is the next schedule for the review? gud day! i am interested to take the face-to-face review classes for the real estate brokers exam on march 2011. you made an announcment posted in your website that you offer review classes on feb 2012. i would like to know where shall i go to register? 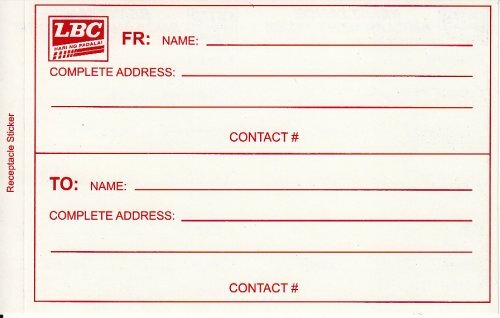 could i have your office address please and your contact no? i would appreciate if i could have your response to this email as soon as possible. thanks! [From the Admin] Hi! The cost of the RESAR Online Review is P1,980. For details, please join the RESAR Online Review Announcement List. Thanks! Hi i message a while back kaso i dun know bakit di napost anyway.. Im aspiring to become a broker, im graduating march 2012 as a marketing management..i have several experience on sales because of my past jobs but not in realty..is it possible that i could take the exam? If ever possible what are the pre requisite before ill take the exam? Want to know the infos please and i want to have a review in your center.. Please give me some infos on what to do.. Ill be waiting thank u ;). Hi! I would like to be a real estate broker. Where do I need to do to become one? I am currently based in Leyte. [From the Admin] Hello! You need to be a college graduate, and you also need to earn 120 units in real estate subjects. Some people do this by attending a 120-hour Comprehensive Real Estate Seminar and Review (CRESAR), which is a face-to-face seminar where you can get a notarized Certificate of Attendance. Thanks! HOW MUCH DO I NEED TO PAY VIA LBC PADALA TO REGISTER AND AVAIL OF THIS ON LINE REVIEW? [From the Admin] Hi! Please join the RESAR Online Review Announcement List for the details. Thanks! [From the Admin] Hi! The RESAR Online Review is for aspiring Real Estate Brokers. Thanks! [From the Admin] Hi! We highly recommend that you join the RESAR Online Review Announcement List for more information. Thanks! [From the Admin] Hello! Self-directed learning po ang approach sa RESAR Online Review. You may access the online review any time you wish (within the reasonable uptime rates of the webserver, of course, because there’s no affordable webserver that’s available 100% of the time… anyway, we have a back-up webserver, just in case). You may watch and replay the online videos as many times are you want. In other words, you can review for the real estate brokers’ exam when it is convenient for you. All you need is a reliable internet broadband connection, a computer that has Firefox and Adobe Flash Player, and a good pair of headphones/headset. [From the Admin] Hello! We haven’t heard yet from the past organizers of Cebu-based face-to-face Comprehensive Real Estate Seminar and Review or CRESAR sessions (in preparation for the real estate brokers’ exam). As soon as we get info such as schedules and pricing, we will post it online. [From the Admin] Hello! Are preparing for the Real Estate Brokers’ Exam? Pwede po kayo mag review online (RESAR Online Review Syllabus – RE Brokers). Hindi nga lang po natin alam kung kailan ang next real estate brokers’ exam ng PRC. At wala pa hong nagre-release ng schedule sa mga dating face-to-face Real Estate Brokers Exam review service providers. I am interested to join. kailan ang next sked? [From the Admin] Hi! You may join the RESAR Online Review anytime. Please sign-up or subscribe to the RESAR Online Review Announcement List and the details will be sent to you via email. Please note that we haven’t seen any official announcement yet from the PRC regarding when the next Real Estate Brokers’ Exam will be held. Hi. I am interested to enroll in the review. When will be the next schedule? Please advise. [From the Admin] Enrollment is on-going. Please join the RESAR Online Review Announcement List for details. Thanks! Hi! Is the online review at P1940 still open? Thanks. [From the Admin] As of today, you may still get join the RESAR Online Review for only P1,980. The price may go up, though, in the coming months. On the contents, just would like to ask please what are the specific contents of the online review? 1) how many multiple choice questions? 2) what topics are covered? did you cover the syllabus for the exams on March 27, 2011? kindly specify enumerate specific topics included. 3) you’ve mentioned this is Pre-RESA Law coverage, please expound? Appreciate your response. Thanks and more power! [From the Admin] Hi! At the moment, there are 12 multiple-choice quizzes online (twenty questions per quiz). Pre-RESA Law coverage means that not all the topics listed in the RESA Law RA 9646 are covered by the RESAR Online Review. hi, do i need to be a college graduate for me to be qualified to take the exam? Hope the Prc will not be so strict about their requirements, experienced and track record must be acceptable to them, would that be possible? [From the Admin] Hi! Based on the RESA Law IRR (RA 9646), you should have completed a college degree course before you may take the REB Exam. Perhaps you can appeal your case? Thanks! If you need more info about the RESAR Online Review, please join the RESAR Online Review Announcement List which delivers info and details via email. I’m only enrolled in the 40-day access. How can I avail of the lifetime membership? [From the Admin] Hello! There are no available Lifetime Membership slots at the moment. Thanks! Hi is this online review accredited by the PRC? If not are you affiliated with any formal review that your customers can join? Very interested in the materials. [From the Admin] Hello! The RESAR Online Review is not accredited, and neither is it affiliated with any formal review service provider. 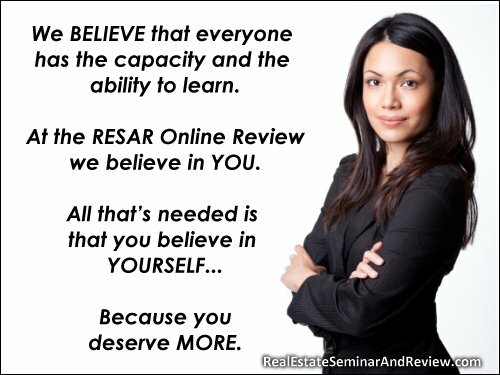 The RESAR Online Review is a purely optional web-based membership site that uses modern distance learning techniques to help you learn real estate concepts faster, and retain the information longer, to help improve your chances of scoring higher in the real estate brokers exam. Hi! I’ve been a Licensed California Real Estate Broker since 1978 and my license is still current and active. I have a B.S.B.A. degree in accounting from PSBA. I took the required statutory college courses in real estate in California. Presently, I am permanently residing in Binangonan, Rizal. What would I need to present to PRC to be able to sit for the March 27, 2011 exam, and where do I get the application form and how much is the fee? Thank you! [From the Admin] You may get the Exam Application Permit from the PRC. Please ask them if they will accept your Transcript of Records (real estate college course) as proof of your having earned 120 units in real estate subjects. At the moment, what people are presenting are Certificates of Completion of X number of hours of the Comprehensive Real Estate Seminar and Review (CRESAR). hi! my transcript of records does not bear a scanned picture, as stated in the requirements of prc. what do i do? do i still have to get a certification from the school? is a certified true copy of my transcript enough? thanks a lot. Based on this, we don’t think your TOR should have a scanned picture. hi, am an OFW , i graduated as BS Radiologic Technology , Board passer , am interested to take Broker”s Licensre Examination, am I qualified? Is it possible to have online review only ? when will be the scheduled exams. please help thanks. [From the Admin] Yes, you are qualified to take the PRC’s March 27, 2011 Real Estate Brokers Exams, provided you can present a Certificate of Completion of 120 units of real estate subjects. The deadline for the application for the Exam Permit is on March 7, 2011. Thanks! Hi,im john im interested in your real estate online review,do you also an online video?could i have it?how can i avail? [From the Admin] Hi! Please join the RESAR Online Review Announcement List for details… Thanks! Hi, I am interested to avail of your online review for real estate seminar / broker’s exam… Please send me detail on how to go abt it..
[From the Admin] Thank you for asking! Yes, the 180-day access package is available. Please join the RESAR Online Review Announcement List for details. Thanks! I mean, don’t you have any online payment besides LBC door to door payment as you indicated? [From the Admin] Thank you for asking. We use the LBC tracking number to help generate the passwords of RESAR Online Review members. Also, LBC provides a secure system that reassures both parties of the transaction. Thanks! If i enroll in this online review, can i still be qualified in march 27, 2011 exam? Is this online review accredited or recognized by the PRc? After this online thing, i am already qualified to take the broker’s exam? Thanks! [From the Admin] Hi! You need to attend a face-to-face Comprehensive Real Estate Seminar and Review or CRESAR, so that you can earn the needed 120 units in real estate subjects. The RESAR Online Review is a supplementary review that will help you learn faster real estate concepts, and retain the information for longer periods of time, so that you improve your chances of getting a higher score in the real estate brokers’ exam. For more details, please join the RESAR Online Review Announcement List. Thanks! I wish to enroll in this online review. Do you cover the same topics as the ones required by the PRC’s 120 hours review in order for me to passed the exam this March? The ones which are highlighted like this are covered in the RESAR Online Review. I’m interested about the online real estate review. Kindly email me details on how-to. Thanks. [From the Admin] Hello! Please join the RESAR Online Review Announcement List, and the details will be sent to you via email. Thank you! [From the Admin] At this point in time, we haven’t heard of other CRESARs offered in Cebu. As far as the RESAR Online Review is concerned, please join the RESAR Online Review Announcement List for the payment details. Thanks! i would like to ask what are the basic requirements to take the test? does PRC required college grad..
would my real estate experience count? i mean would they (PRC) considered my experience as equivalent to their educational attainment requirements? [From the Admin] Hi! Based on the RESA Law IRR (RA 9646), you need to be a graduate of at least a 4-year college course before you may take the real estate brokers’ exam. im interested to take the online review….i’m from baguio city…. [From the Admin] Hi! Please join the RESAR Online Review Updates and Announcement List, to have a better idea of what it takes to succeed with the online review. Thanks! Hi! I’m Interested to this online review glad u have this great offer because we are far from manila this program is very rewarding. Thank you very much! do u still have online review? pls email me the details..asap..
on 11 Nov 2010 at 11:13 am 38 Ian N.
[From the Admin] Hi! Please join the RESAR Online Review Announcement and Updates List for more details. We are waiting for the PRC to release an official statement regarding the real estate brokers’ licensure exams. Yes, you will need to apply for an examination permit with the PRC. I am interested to take the Real Estate Broker examination. How this online review help me to be a licensed broker. What would be my benefits if I enrolled in your review? Is the enrollment on-going? when would be the start of the class? Kindly let me know. I would like to be licensed broker this coming 2011. [From the Admin] The RESAR Online Review uses multimedia and learning tactics to help you understand and retain for longer periods of time key real estate concepts and topics needed by real estate brokers. You have full control of your time, and all you need is a reliable high speed internet broadband connection, plus headphone/headset or a good external PC speaker. Yes, enrollment is on-going. Your day you join will be the first day of the review in this web-based membership site. To see some of the benefits of joining the RESAR Online Review, please see RESAR Online Review While You Eat. For the RESAR Online Review details and terms, please join the RESAR Online Review Announcement List. Thanks! [From the Admin] For the RESAR Online Review details and terms, please join the RESAR Online Review Announcement List. Thanks! If i register for the online review, would i be able to print your review materials?.. I always go on out-of-town trips where internet connection is not available. [From the Admin] The downloadable PDF files can be printed. To get the most out of the RESAR Online Review, however, you must have a headset/headphone or good external speakers, as well as a reliable internet broadband connection in order to view and listen to the online video tutorials. Thanks! Hi, I hope you can send me an email of the accredited review centers once you have the info. I heard that the brokers licensure exam will be postponed to Aug 2011 and that review would start next year as well. Is there some truth to this? Also, I’m interested to avail of the online review, for someone who wants to get into the real estate business, is the online review easy to understand? Or are the terms very foreign? [From the Admin] People are guessing, because the PRC apparently has not yet released any official announcement regarding the real estate brokers’ licensure exams. Some review service providers are offering reviews in October or even November 2010. Others will begin in January 2011. And even others don’t want to give out any schedule, because we are waiting for clarificatory guidelines from the PRC. The Online Review will sound foreign at the start, especially for those with zero background in real estate, accounting, law, and business math. But over time, and with repetition, people eventually learn the various concepts in real estate. The Online Review helps you easily learn the lessons through the power of repetition. Can you advice to me when the next schedule of reviewing for Broker & how much the payment for reviewing many thanks. [From the Admin] We will post that info as soon as the accredited review service providers release their skeds and pricing (offline review). In the meantime, you might wish to get more info regarding the RESAR Online Review for aspiring real estate brokers. Thanks! [From the Admin] Thank you for your inquiry. The RESAR Online Review is a web-based membership site containing self-study lessons in multimedia format. You may also post questions in the comments area. This means that you can join anytime. Your joining date will be the starting date of your series of lessons online. For example, if you join on Oct 4, then your first lesson will be ready on Oct 4, while your second lesson will be available on Oct 6. If your neighbor joins on Oct 5, then her first lesson will be ready on Oct 5, while her second lesson will be on Oct 7 (because the lessons are published online every other day to protect you from information overload).